A vision in delicate Chantilly lace, your dream wedding dress has suddenly transformed you into a beautiful princess. You barely recognise yourself. But even though you’ve now got your dress, your planning can’t end here. Nope. Now, you have to find everything to match – you need the shoes, the clutch, the bridesmaid dresses, the venue décor, the chocolate fountain and even the cake. Oh, and chocolate fountain hire london, can help you with the fountain. It all seems never-ending, doesn’t it? Believe us, we’ve been there. We know just how stressful planning a wedding can be. But we’re all about the fun, which is why we’re bringing you one of our favourite parts of any wedding – the cake! Believe it or not, but picking your wedding cake is one of the most important decisions you’ll make about your big day. Not only does it need to taste incredible, but it also needs to look spectacular, fitting in with your wedding theme and venue. If you’re planning a wedding set in fancy surroundings, then a tall, tiered cake may be best. For informal weddings, you can choose from pretty cupcakes or smaller designsdv s. Styles can vary from traditional varieties, decorated with ivory icing and fresh flowers, to quirkier cakes with hand-painted designs. But if you’re struggling to pick the one, then fret not. Just pour yourself a cuppa, cut yourself a thick slice of cake (ours is coffee and walnut) and read on. More and more, weddings are becoming reflections of a couple’s wacky personality, so why not use the cake and wild? Paint it up with rainbows of colour, or choose intricate patterns in the design. It’s also popular to play around with the flavours of the sponge, with the traditional fruit cake often being ditched. Flavourings can actually be a pretty tough decision – do you go for vanilla, lemon, red velvet, chocolate or even mocha? I know, we like the sound of them all too! If you’re not particularly sweet-toothed, then why not pick a cheese cake? 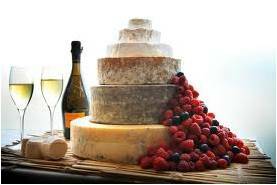 Gather together your favourite cheeses, stack ‘em up high, decorate with fresh fruits and enjoy. 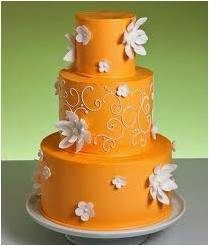 The prices of wedding cakes can be eye-watering, often running into their thousands. It’s important to remember that the more intricate the design, the more it will cost – bespoke cakes will take hours and hours, meaning they will set you back mega bucks. However, if you’re on a budget, there are still plenty of options. Cupcakes often work out much cheaper than tiered cakes, but you can also cut back on the design hours by adding fresh flowers to the décor, rather than hand-spun sugar flowers. How on earth do you pick a wedding cake design when there are thousands of beautiful fancies out there? 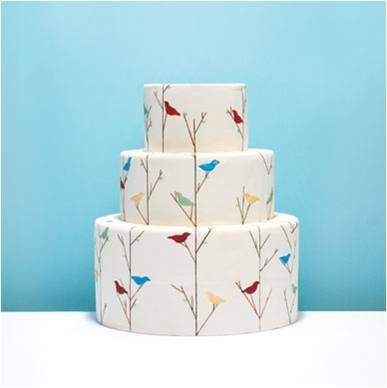 Do you opt for traditional ivory cakes, or do you go all-out with an in-your-face print? 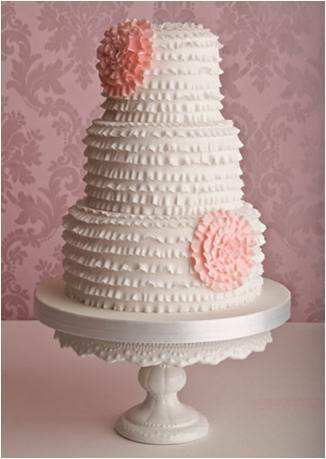 Use your spectacular, lacy dress as inspiration by requesting a similar cake. Ask your designer for plenty of ruffles and lace, or why not replicate the intricate details on your dress with sugared flowers? These cakes are great for more traditional weddings as they work best in simple ivory. However, you can add your own personal touch with splashes of colour in the detailing, or even the cake stand. We’ve attended countless pretty vintage weddings in the last few years, and we love them! All you rocking retro brides should complement delicate wedding china sets or spectacular birdcage centrepieces with a vintage cake design – think lots of lace, pearls and plenty of romance. Believe it or not, but birds (although not live ones!) can also look great on old-school cakes. Many brides-to-be design their cake around the colour scheme of their big day, whether that means adding splashes of pink, pretty blue ribbons or gold flowers. 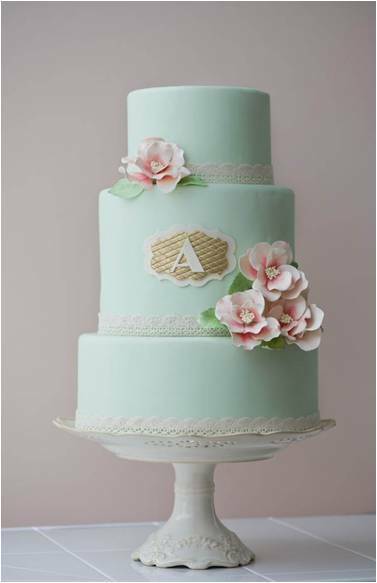 This year, many are plumping for chic green as their colour, which can be seen in recent cake trends. Mint green cakes look breathtakingly pretty, especially when combined with pastel shades such as pink or peach. 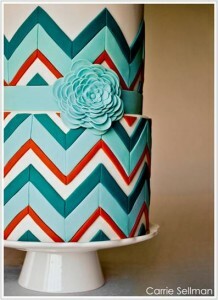 Geometric prints are all over the catwalks right now and wedding cakes look set to follow. These designs are wonderfully quirky and are sure to make a statement on your big day. From pretty pastels to funky monochrome decor, chevrons or square shapes can transform a regular cake into a knock-out creation! If you felt pressured into picking a traditional, tiered cake when all you really wanted was a wild, fluro pink design, then don’t worry – you can show off your personality in other ways, like transforming a table into a cake and sweet stand. 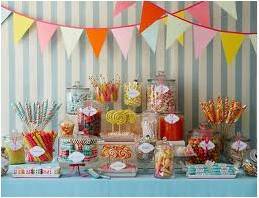 Invite guests to take their pick from penny sweets, delicious cupcakes, colourful macarons and, of course, a chocolate fountain to top it all off. So, now you’ve read our lowdown, which cake are you going for? Are you a traditional bride, or do you want an in-your-face design?